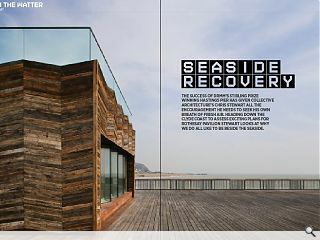 The success of Drmm’s Stirling prize winning Hastings Pier has given Collective Architecture’s Chris Stewart all the encouragement he needs to seek his own breath of fresh air. Heading down the Clyde coast to assess exciting plans for Rothesay Pavilion Stewart looks at why we do all like to be beside the seaside. 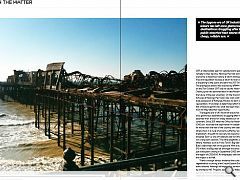 2017, a rollercoaster year for seaside towns seeking a remedy to their decline. 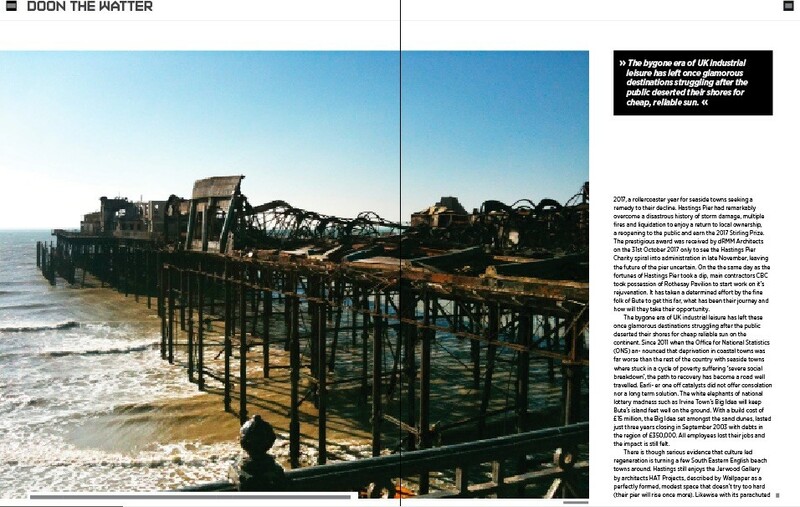 Hastings Pier had remarkably overcome a disastrous history of storm damage, multiple fires and liquidation to enjoy a return to local ownership, a reopening to the public and earn the 2017 Stirling Prize. 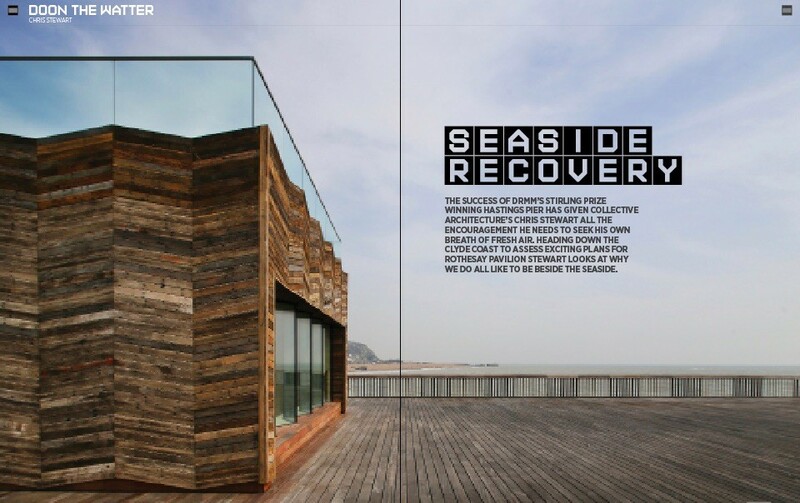 The prestigious award was received by dRMM Architects on the 31st October 2017 only to see the Hastings Pier Charity spiral into administration in late November, leaving the future of the pier uncertain. 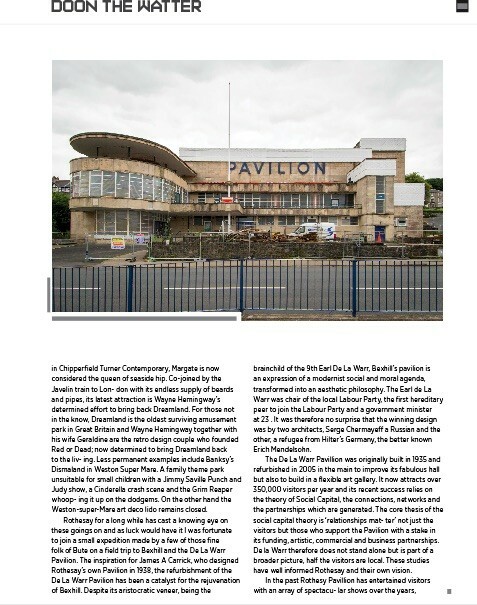 On the the same day as the fortunes of Hastings Pier took a dip, main contractors CBC took possession of Rothesay Pavilion to start work on it’s rejuvenation. It has taken a determined effort by the fine folk of Bute to get this far, what has been their journey and how will they take their opportunity. The bygone era of UK industrial leisure has left these once glamorous destinations struggling after the public deserted their shores for cheap reliable sun on the continent. Since 2011 when the Office for National Statistics (ONS) an- nounced that deprivation in coastal towns was far worse than the rest of the country with seaside towns where stuck in a cycle of poverty suffering ‘severe social breakdown’, the path to recovery has become a road well travelled. Earli- er one off catalysts did not offer consolation nor a long term solution. The white elephants of national lottery madness such as Irvine Town’s Big Idea will keep Bute’s island feet well on the ground. With a build cost of £15 million, the Big Idea set amongst the sand dunes, lasted just three years closing in September 2003 with debts in the region of £350,000. All employees lost their jobs and the impact is still felt. There is though serious evidence that culture led regeneration is turning a few South Eastern English beach towns around. Hastings still enjoys the Jerwood Gallery by architects HAT Projects, described by Wallpaper as a perfectly formed, modest space that doesn’t try too hard (their pier will rise once more). Likewise with its parachuted in Chipperfield Turner Contemporary, Margate is now considered the queen of seaside hip. Co-joined by the Javelin train to Lon- don with its endless supply of beards and pipes, its latest attraction is Wayne Hemingway’s determined effort to bring back Dreamland. 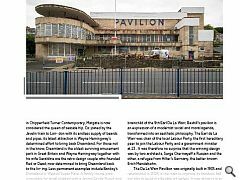 For those not in the know, Dreamland is the oldest surviving amusement park in Great Britain and Wayne Hemingway together with his wife Geraldine are the retro design couple who founded Red or Dead; now determined to bring Dreamland back to the liv- ing. Less permanent examples include Banksy’s Dismaland in Weston Super Mare. A family theme park unsuitable for small children with a Jimmy Saville Punch and Judy show, a Cinderella crash scene and the Grim Reaper whoop- ing it up on the dodgems. On the other hand the Weston-super-Mare art deco lido remains closed. Rothesay for a long while has cast a knowing eye on these goings on and as luck would have it I was fortunate to join a small expedition made by a few of those fine folk of Bute on a field trip to Bexhill and the De La Warr Pavilion. The inspiration for James A Carrick, who designed Rothesay’s own Pavilion in 1938, the refurbishment of the De La Warr Pavilion has been a catalyst for the rejuvenation of Bexhill. Despite its aristocratic veneer, being the brainchild of the 9th Earl De La Warr, Bexhill’s pavilion is an expression of a modernist social and moral agenda, transformed into an aesthetic philosophy. The Earl de La Warr was chair of the local Labour Party, the first hereditary peer to join the Labour Party and a government minister at 23 . It was therefore no surprise that the winning design was by two architects, Serge Chermayeff a Russian and the other, a refugee from Hilter’s Germany, the better known Erich Mendelsohn. The De La Warr Pavillion was originally built in 1935 and refurbished in 2005 in the main to improve its fabulous hall but also to build in a flexible art gallery. It now attracts over 350,000 visitors per year and its recent success relies on the theory of Social Capital, the connections, networks and the partnerships which are generated. The core thesis of the social capital theory is ‘relationships mat- ter’ not just the visitors but those who support the Pavilion with a stake in its funding, artistic, commercial and business partnerships. De la Warr therefore does not stand alone but is part of a broader picture, half the visitors are local. These studies have well informed Rothesay and their own vision. In the past Rothesy Pavillion has entertained visitors with an array of spectacu- lar shows over the years, currently being documented by YARN on the Rothe- say Pavilion web site ( http://www.rothesaypavilion.co.uk ). What is less well know is the abundance of local activities undertaken by Rothesay Pavillion which has included weddings, flower and art shows, a basement shooting gallery, tea dances, Beech Grove Question Time and the gathering place for over 40 community groups. In particular since 1956 the Pavilion has been the home of Bute’s right of passage for the island’s youth, both girls and boys, through it’s five a side football tournament. Often given priority over many a touring band who have been forced to play to an audience hemmed in by the pitch. This pivotal role played by both visitors and residents has informed future activi- ties proposed by the Rothesay Pavilion Charity. The main auditorium will be re- engineered and complimented by a second performance space geared for young people enjoying it’s own separate entrance. 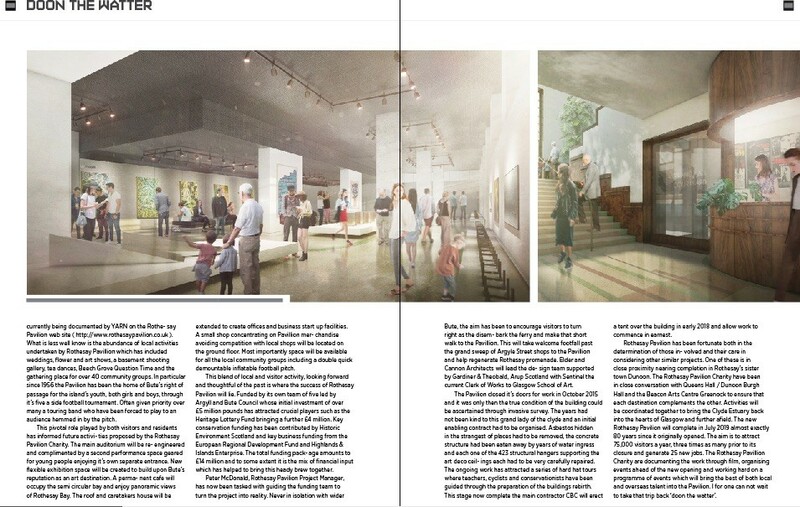 New flexible exhibition space will be created to build upon Bute’s reputation as an art destination. A perma- nent cafe will occupy the semi circular bay and enjoy panoramic views of Rothesay Bay. The roof and caretakers house will be extended to create offices and business start up facilities. A small shop concentrating on Pavillion mer- chandise avoiding competition with local shops will be located on the ground floor. Most importantly space will be available for all the local community groups including a double quick demountable inflatable football pitch. 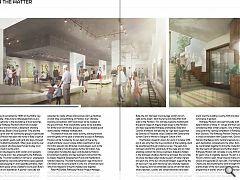 This blend of local and visitor activity, looking forward and thoughtful of the past is where the success of Rothesay Pavilion will lie. Funded by its own team of five led by Argyll and Bute Council whose initial investment of over £5 million pounds has attracted crucial players such as the Heritage Lottery Fund bringing a further £4 million. Key conservation funding has been contributed by Historic Environment Scotland and key business funding from the European Regional Development Fund and Highlands & Islands Enterprise. The total funding pack- age amounts to £14 million and to some extent it is the mix of financial input which has helped to bring this heady brew together. Peter McDonald, Rothesay Pavilion Project Manager, has now been tasked with guiding the funding team to turn the project into reality. Never in isolation with wider Bute, the aim has been to encourage visitors to turn right as the disem- bark the ferry and make that short walk to the Pavillion. This will take welcome footfall past the grand sweep of Argyle Street shops to the Pavillion and help regenerate Rothesay promenade. Elder and Cannon Architects will lead the de- sign team supported by Gardiner & Theobald, Arup Scotland with Sentinel the current Clerk of Works to Glasgow School of Art. The Pavilion closed it’s doors for work in October 2015 and it was only then the true condition of the building could be ascertained through invasive survey. The years had not been kind to this grand lady of the clyde and an initial enabling contract had to be organised. Asbestos hidden in the strangest of places had to be removed, the concrete structure had been eaten away by years of water ingress and each one of the 423 structural hangers supporting the art deco ceil- ings each had to be very carefully repaired. The ongoing work has attracted a series of hard hat tours where teachers, cyclists and conservationists have been guided through the preparation of the buildings rebirth. This stage now complete the main contractor CBC will erect a tent over the building in early 2018 and allow work to commence in earnest. Rothesay Pavilion has been fortunate both in the determination of those in- volved and their care in considering other similar projects. One of these is in close proximity nearing completion in Rothesay’s sister town Dunoon. The Rothesay Pavilion Charity have been in close conversation with Queens Hall / Dunoon Burgh Hall and the Beacon Arts Centre Greenock to ensure that each destination complements the other. Activities will be coordinated together to bring the Clyde Estuary back into the hearts of Glasgow and further afield. The new Rothesay Pavilion will complete in July 2019 almost exactly 80 years since it originally opened. The aim is to attract 75,000 visitors a year, three times as many prior to its closure and generate 25 new jobs. The Rothesay Pavillion Charity are documenting the work through film, organising events ahead of the new opening and working hard on a programme of events which will bring the best of both local and overseas talent into the Pavilion. I for one can not wait to take that trip back ‘doon the watter’.